Rat ROR1, His Tag (RO1-R5221) is expressed from human 293 cells (HEK293). It contains AA Gln 30 - Glu 403 (Accession # EDL97819). The protein has a calculated MW of 43.5 kDa. The protein migrates as 60-67 kDa under reducing (R) condition (SDS-PAGE) due to glycosylation. Rat ROR1, His Tag on SDS-PAGE under reducing (R) condition. The gel was stained overnight with Coomassie Blue. The purity of the protein is greater than 95%. Tyrosine-protein kinase transmembrane receptor ROR1 is also known as Neurotrophic tyrosine kinase, receptor-related 1 (NTRKR1), which belongs to the protein kinase superfamily or tyr protein kinase family or ROR subfamily. 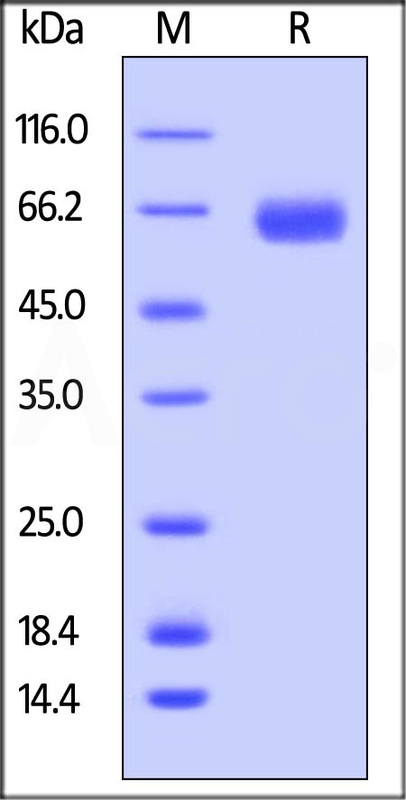 ROR1 contains 1 FZ (frizzled) domain, 1 Ig-like C2-type (immunoglobulin-like) domain, 1 kringle domain, 1 protein kinase domain. ROR1 is expressed at high levels during early embryonic development. The expression levels drop strongly around day 16 and there are only very low levels in adult tissues. Isoform Short is strongly expressed in fetal and adult CNS and in a variety of human cancers, including those originating from CNS or PNS neuroectoderm. ROR1 could interact with casein kinase 1 epsilon (CK1ε) to activate phosphoinositide 3-kinase-mediated AKT phosphorylation and cAMP-response-element-binding protein (CREB), which was associated with enhanced tumor-cell growth. (1) Masiakowski P., et al., 1992, J. Biol. Chem. 267:26181-26190. (2) Reddy U.R., et al., 1996, Oncogene 13:1555-1559. (3) Greenman C., et al., 2007, Nature 446:153-158.